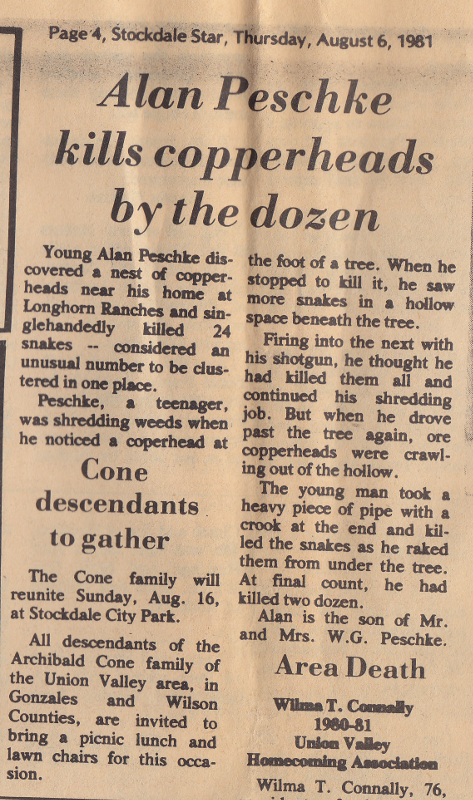 I still haven't come across the photo I took of all these dead snakes, but my dad passed on to me the newspaper that this article was in. This was our smalltown newspaper at the time, the Stockdale Star. My grandmother went to the office and told them the story. She thought it was news-worthy. I guess it was. I think the Floresville Chronicle-Journal also ran this article, with slightly different wording; if I recall correctly, their headline used the words "sandhill boy" instead of my name. August of 1981 would mean I was 17 years old at the time. You've already seen this clipping if you're "friends" with me on FB, but I thought I'd detail the whole story here just for kicks. I was shredding the field in front of our house with the old Ford 8N tractor that I have mentioned previously. The field is mostly open, but through one side of it runs a very shallow "creek," really just a low spot that rain drains through when it rains enough. There are several trees growing along this low spot. So I was winding my way through this tree-section on the tractor, and at one point just happened to spot a copperhead. So naturally, I stopped the tractor to kill it. We routinely killed venomous snakes, which almost always meant copperheads where we lived (my dad still lives there, by the way), but occasionally a cottonmouth or coral snake would turn up, too. Anyway, we had this metal pipe that was about 5 feet long with a 90-degree elbow on one end; we used this pipe as our post hole tamping tool. It was leaning against the fence nearby, so I used it to smack the snake. As I have also previously said, the 8N had a front-end loader on it, and the hydraulic system wasn't able to keep it up completely all the time, so we had another big pipe baling-wired across the front end to hold the loader up. The baling wire loops were big enough, so I just slipped our post-hole tamper through the loops and continued on my way. I made another circle around the field and came back by the trees again. I saw another snake, and thought at first that I had somehow failed to stove the first snake's head in hard enough, and it was still alive. So I got down off the tractor, took out the post hole tamping pipe, and walked toward the snake. Then I saw another snake. So I stopped, and then saw another snake. And another one. I appeared to be surrounded by copperheads. I retraced my steps back to the tractor and got back up in the seat, and standing there atop the tractor I surveyed the area to see what was going on. I could see several snakes. So I got back down and began working my way from the nearest snake to the farthest. After smacking a snake I would scoop it up with the bent end of the pipe and toss it back behind me so I would know where all the dead ones were. After I killed all the ones I could see there near the tractor, I made a circle around the trees and found a couple more. I remember thinking, "Daddy's never gonna believe this." I kept snooping around and eventually noticed a hollowed-out space beneath the roots of one of the trees. Down in that hollow was a seething mass of copperheads. So I checked my pile of dead snakes to make sure they were all good and dead and walked back to the house and got my dad's old 16-gauge single-shot shotgun. My grandmother asked me what I was doing, and I told her, "I found a whole bunch of copperheads." "Okay," she said, "be careful." I remember wondering if any of the BBs would ricochet off the tree and hit me, but I went and fired into that hole anyway. I waited a minute for the dust to clear, and saw movement, so I shot a second time. Then I decided that I was just wasting shells, so I started using the hook on the end of that pipe to rake out one snake at a time and dispatch it. It turned out that the top layer of snakes had caught all the shot and I only killed 3 or 4 by shooting them. One really big one had been blown in two; it was in the process of digesting a toad, which was pretty gross. The snakes all ranged in size from about a foot up to about 18 inches. Anyway, one at a time, I pulled out snakes and smacked them with the pipe until the hole was, as far as I could see, empty. Then I lined them all up and counted 24 snakes. I took a picture of them with one of those old Kodak telephoto cameras with the 110 film. The last time I saw that picture, it had faded pretty badly. The old 110 film didn't stand up to time very well. And that wasn't exactly the end of the story. Over the next few years, I took to checking out the "snake hole" periodically. Every summer I found a few more snakes there, although never as many at once as that first time. I guess that over a period of 4 or 5 years, I probably killed more than 40 snakes out of that one hole. Rain and erosion have since filled the snake hole in. The tree is still there, but there's no place for the snakes to hide there anymore. I'm sure they've found another spot somewhere.